After the super response for our 1st AMA session; yesterday (June 7th), we organised our 2nd AMA session with our expert, Bijay from Nepal. Topic for the session was “Trekking in Nepal” – House of Mt. Everest. There is so much to explore in the region – truely a Trekker’s Paradise. Ask Me Anything or AMA sessions are online Q&A session between usually an expert and individuals intending to learn for the expert’s experience. Little like “I have some doubts” or “I want to know if…” session, really a great way to get answers to a lot of those very specific questions staright from an expert! It could be better. So for #TrodlyAMA Session #2 we invited our Nepal trekking expert Bijay to share his expereince and guides trekkers who are interested in taking up a trek in Nepal in near future. 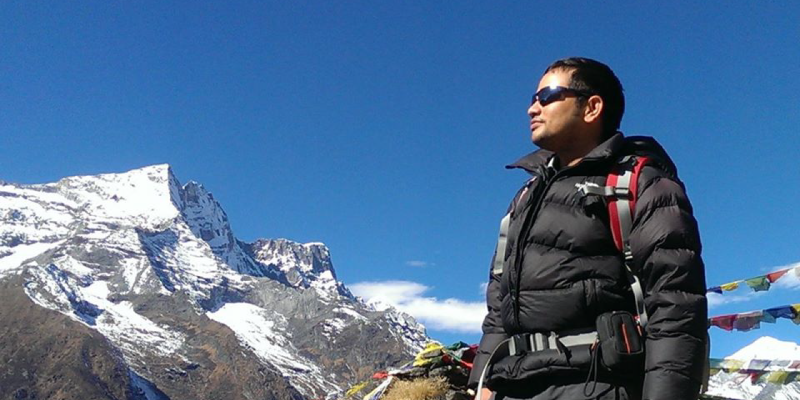 Bijay is a former Nepal trekking, tour & nature guide and has been working in tourism industry since last decade. His love for nature led him to the Nepalese tourism industry at the age of 19. He shares shares his first hand experience of being in the trekking trails of Everest, Annapurna, Langtang, Manaslu, Mustang and many more off the beaten trails. His experiences of being in the Himalayas, struggling with pros and cons, inspiring trekkers to achieve their goal, rescuing people in the emergency and tackling the difficulties in the mountains has helped trekkers to plan the perfect trekking journey in the Himalayas of Nepal. For people who missed the session, here’s a complilation of all that was shared. #1. Hi, Can we do the EBC trek during July end or Early August? Hello Rajiv, Everest basecamp (EBC) trek is more difficult during the end of July and starting of August but it is recommended after the mid- August. #2. Also I find all treks available online are either very costly or the decently priced ones do not include meals. Why is it so? Most of the people are looking for the cheapest prices for Everest trekking, for that reason operators are selling the trekking packages without food to make it cheaper. If the packages includes flight to and from Lukla and all meals then the price shoots up. That’s why you see very different pricing for Everest trekking. #3. And till when can it be done? This trek can be done till the end of December. January is not recommended. #4. How dangerous is the path to cover this trek? Everest Base Camp trekking path is not dangerous but you need to be careful while taking pictures, passing by yaks, few places are slippery and sometime if there is snowing you need to be careful, like any other high altitude trek in Himalayas. You are always suggested to follow the instruction of your team leader/guide. To sum up, this trek is not dangerous but you need to be careful. #5. If I book a Nepal trek which does not include insurance, can I buy it on reaching Kathmandu? How much would insurance cost for Annapurna circuit trek? Hello Sujit, Insurance is a must if you are trekking above 3000 meters in the Himalayas. I always recommend to buy insurance before you leave your home. There is not any insurance company in Nepal who sell insurance for trekking to foreigners. You can search different companies like World Nomadas and many other via online or different company in your country. The cost of insurance varies on the policy of company and coverage, so final price can be checked online when you select all policy. Please be sure that your insurance policy covers the emergency helicopter evacuation and medical treatment in the case of altitude sickness. Besides that you can also add the coverage of possible happening on the journey. #6. Hi Bijay, 2 most popular treks are Everest base camp and Annapurna – Are there other more great treks too? Hello Anshul, Of course Annapurna and Everest are the most popular trekking in Nepal but there are many off the beaten trails that gives you the perfect experiences of being in the remote mountain village in Nepal. Those trekking are Langtang Trekking, Upper Mustang Trekking- A taste of Tibet & Nepal, Everest High Passes Trekking- A complete adventure trek in Everest, Gokyo Valley Trek – Off the beaten trail of Everest. There are many cultural and festival treks as well that are worth experiencing during the particular time of the year. #7. Also I saw on Trodly.com that meals are not included in price? Explanation that I got was that it’s a “Tea-house” trek and things are available on the way. What does Tea-House trek means exactly? Hello Kamal, there are two kinds of trekking popular in the Himalayas of Nepal. Tented camp trek- it means all the arrangement of food prepared by local staff and sleeping at tent. Another option is teahouse trek- it means you will spend your night at the basic guesthouses also known as teahouse. These are the basic accommodation provided in the Himalayas. These teahouses/guesthouses serve all food for you. Foods of different taste are available in these teahouses. So teahouse trek means staying at the guesthouse/teahouse where you can find all meal options. #8. What physical fitness is required for Everest Base Camp trekking? Hello DB, Everest Base Camp Trek is not a technical climb and you don’t need any technical climbing experience to make this trek. You don’t even need experience at high altitude to complete this trek. Moderate fitness level is needed but no previous high altitude trekking experience is required. Some physical fitness programs such as running, swimming, hiking is recommended before you get on your journey. You might feel some uneasiness before being fully acclimatized. To prepare for a strenuous trek you should begin training at least two to three months before your departure. Joining some aerobic exercise, involving in brisk walking with some ascents and descents, climbing up and down the stairs of a tall building, eat healthy food, and yoga also helps. Besides that the altitude and bodies acclimatization to the lack of oxygen and is the real key to success. We have been doing our own research over a number of years and we have decided to add an additional acclimatization day in the required places. You need to be mentally prepared to completing the journey as well, a “No Quiting” state of mind is very important. The positive attitude and the willingness is the key to successful trip. #9. What documents are required to book the Annapurna base camp trekking? Hello Mayank, Everest Base Camp trekking requires the TIMS card & Everest National Park permit. So it needs two kinds of trekking permits for all trekkers Indians and Foreigners- NRI as well. Your trip organisers will work toward arranging that for you. Apart from the that, you need to submit passport copy, insurance paper and two passport sized pictures upon booking the trek. #10 What are the most challenging trek in Nepal? The most challenging trek in Nepal is trekking around Dhaulagiri circuit though all trekking above 5000 meters that includes the remarkable high passes in the Himalayas are challenging trekking. #11. When planning for Nepal, I want to make best of my time (leaves are pain to get). I would love to explore as much as possible, other then treks, What all I can do if I plan a 3 week plan to Nepal? Yes, Nepal is paradise for trekers but there are many other adventure trips in Nepal like Bungee Jumping, Paragliding, Parahawking, Rafting, Mountain flight and peak climbing. Nepal culturaly and heritage tours not to be missed.